You'll be £4.99 closer to your next £10.00 credit when you purchase Battleground Sussex. What's this? From its south-eastern tip Sussex is little more than sixty miles from continental Europe and the county’s coastline, some seventy-six miles long, occupies a large part of Britain’s southern frontier. Before the days of Macadam and the Turnpike, water travel could prove more certain than land transportation and the seas that define the borders of our nation aided, rather than deterred, the invader. Though the last successful invasion of Britain took place almost 1,000 years ago, the gently shelving beaches of Sussex have tempted the prospective invader with the promise of both an easy disembarkation and a short and direct route to London – the last time being just seven decades ago. As the authors demonstrate, the repeated threat of invasion from the Continent has shaped the very landscape of the county. The rounded tops of the Iron Age hill forts, the sheer walls of the medieval castles, the squat stumps of Martello towers, the moulded Vaubanesque contours of the Palmerstone redoubts and the crouched concrete blocks and bricks of the Second World War pillboxes constitute the visible evidence of Sussex’s position on Britain’s front line. 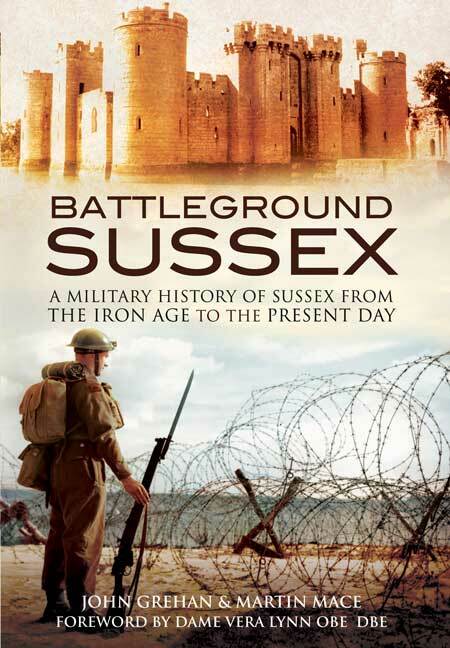 The book is well illustrated…a decent and very readable military history of Sussex and still very useful if you live in, or are planning to visit the county. Overall this is a nice general introduction to the county’s military history and is a good companion for the visitor and to walk recently devised by the Royal geographical society. There can be few counties in England where the tides of war have raged so fiercely. A New book chronicles the bloody battle of Sussex, from the Neolithic man, through to Celtic Forts of the Iron Age to the dark days of the Second World War. In the foreword to the book, Dame Vera Lynn observes there can be few countries in England where so much fighting has taken place. The authors have undertaken a huge task, chronicling the military history of Sussex in exhaustive and at times exhausting detail. Not a read to be devoured in one sitting. When war was declared and Britain was in danger of being invaded, then at last the nation pulled together and could stand behind the leader. The significance of the Battle of Britain was the threat of invasion, which would never have happened, actually united the country. It’s been a book in which Sussex’ contribution to World War Two is explored in depth – but the conclusions may well surprise. Sussex has invariably been the frontline: “That’s been the case right through history, the geography does not change”. A blow-by-blow account of the bloody battle of the Lewes, the strategic importance of Pevensey Castle and an intriguing description of the elite Lewes Home Guard cavalry composed of more than 50 mounted members including jockeys, huntsmen and landowners… just a few of the delights described in the new book tracing the county’s military history. The book contains plenty of illustrations and descriptions of where to find building, castles and invasion or battle sites that should keep the adventurous family occupied throughout the summer. Fascinating facts are piled high. From the days of the Celts, Romans and Saxons to the battle of Hastings; from the dawn of democracy to the English Civil War; from Napoleon to Hitler, Battleground Sussex explains how the country’s proximity to mainland Europe has underpinned several millennia of armed conflict…plus a rebellious spirit which persists today.